The festival of Krishna Janmashtami is also known as Krishnashtami, Gokulashtami or Srikrishna Jayanti. It comes on the eighth day of the Krishna Paksha of the month of Shraavana in the Hindu calendar. Bhagavan Krishna was the 8th son of Devaki and Vasudeva. 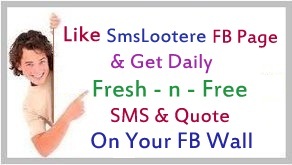 To celebrate this festival with Janmashtami wishes status you need some best SMS collection, so our team “SMS Lootere” select some good messages like Happy Shri krishna janmashtami sms Hindi in 140 words and many more. Wo Bansi wala,Wo Makhan chor,Wo Braj Lala! Shri Krishna k kadam apke ghar aaye…. Mangalmay ho aapko Sri Kirshna Janmashtmi ka tyohar! Such Ka Amrit Gholta Rahe ...!! Aiso mere mann baso sada Bihari Lala. Dil ne kaha kyo na aapse suruaat kare..
Hum ye kaamna karte hai ki. Sada hi hum sab par kripa banaye rakhna. Ab Kis Ki Preet Kare Sweekar? Wish U A very Happy Janmashtmi..
Jai kishan ke Jai gosh se vishva dhanya hai!